Numerous plants, animals, and fungi produce organic compounds that can act on the central nervous system to distort sensory and perceptual reality. For thousands of years hallucinogenic substances have been used by many different cultures to inspire creativity, practice spirituality, and induce euphoria. With the discovery of lysergic acid diethylamide (LSD) in 1943, the use of these “mind-altering” drugs gradually increased, spiking in popularity around the 1960’s . During this time numerous studies were carried out to further investigate these compounds, but much of the momentum of this research ceased when the government made LSD illegal in 1968 . Now more than 40 years later, there is a renewed interest in these drugs and their effects on the human body . Modern techniques, such as the use of competitive radioligand binding, or creation of genetically altered knock out (KO) mice, are now providing us with increased insight into the internal mechanisms of these substances . Of specific interest are the serotonin (5-HT) receptors, which seem to be common targets for many hallucinogenic ligands . Evidence has shown that both phenylalanine and tryptamine based psychedelic drugs act on several 5-HT subtypes, binding with varied affinity . When activated, the g-protein coupled receptors initiate a molecular cascade that is believed to be partly responsible for the intoxicating effects of the drugs . These findings have strong implications for the treatment of psychopathology, as many of these receptors are targets for the treatment of schizophrenia and mood disorders . Hallucinogenic compounds are a specific subset of drugs capable of producing intense alterations in cognitive and perceptual reality. Unlike the normal human imagination, these surreal abstract experiences appear to be occurring within the external environment . Intoxication effects can mimic the symptoms of psychosis, which is why hallucinogens are also sometimes referred to as psychomimetics . Many of these drugs are illegal to purchase or possess in most countries, including Canada and USA, but not everywhere in the world . Some native South American tribes use a herbal substance called ayahuasca, which contains DMT and is used during religious practices to facilitate divine experiences . DMT in particular is an interesting compound because it is endogenously found in the mammalian brain . Other popular hallucinogens, known as ergolines, are not found naturally and can only be synthetically made in a lab . The most popular example of this drug type is LSD, which was discovered in 1943 by Swiss chemist Albert Hoffmann . The group of classical hallucinogens can be broadly divided into phenethylamines and tryptamines. This division is only structural, mainly based on the chemical backbone of the substance . Below are the some of the most common compounds of research and abuse. The use of animal models has become very popular over the past several decades, as an alternative method of providing insight to our own behaviour, genetics, and physiology . Perhaps the most common mammalian model species are rodents, for reasons including high genetic similarity to humans, and relatively inexpensive and easy maintenance. Research with rats and mice allows us to study the behavioural and neuropharmacological effects of hallucinogens in ways that may not be ethical in human participants . For example, it is not uncommon to create a strain of genetically modified “knock-out” mice in order to test the importance of a specific gene’s involvement in a phenotypic behaviour . This process has been particularly important for providing evidence for the involvement of the 5-HT2A receptor in the intoxication effects of classical hallucinogens . removing the terminator sequence that is blocking expression of htr2A. Research by Gonzalez-Maeso et al. (2007) uses behavioural observation in knockout mice to try to understand the receptors and mechanisms involved in hallucinations . In normal mice, administration of LSD and other known psychedelics produces many measureable response phenotypes. These behaviours include altered exploratory and grooming, elevated body temperature, and a head twitch response (HTR) . Although other nonhallucinogenic 5-HT2A agonists have also been shown to produce the majority of these responses, the HTR seems to be exclusive to psychedelic compounds . Further evidence of the significance of this response in serotonergic hallucinogens was seen when researchers created KO mice lacking the 5-HT2A receptor. This was accomplished by inserting a terminator sequence between htr2A and its promoter . 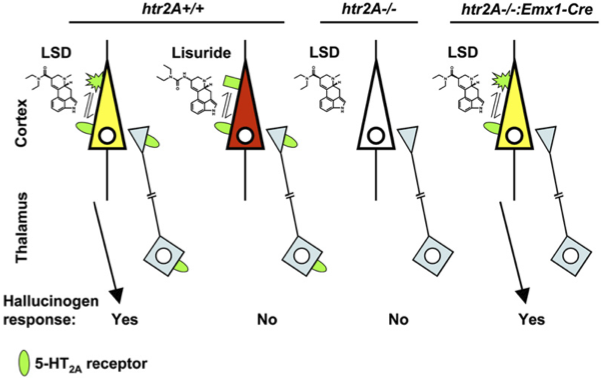 The resultant strain of HTR2A -/- mice showed no HTR upon administration of LSD. Additionally, when these mice were “rescued” by removal of this terminator, the HTR was restored . This result, illustrated in figure 1, provides fairly conclusive evidence that the HTR is mediated by the 5-HT2A receptor and is induced by a mechanism that is unique to hallucinogenic substances . Another method for analyzing receptor-ligand binding affinity is a competitive radioligand binding assay. A strain of identical cells is used to produce a clonal monoculture, and is kept in conditions that reflect the internal environment. In order to proliferate, these cells need to be supplemented with nutrients, amino acids, ions, and growth factors . As shown in Knight et al. (2004), once the cell culture has been established human 5-HT2A DNA can be transfected into the cells, where it will be transcribed and translated into protein . A modified radioactive DOI isotope is then provided in large amounts in order to fully saturate the receptors . By measuring the amount of radioligand displacement that occurs, we can numerically quantify specific ligand-receptor binding affinities . In their experiement, Knight et al. (2004) tested 24 ligands that preferentially bound to the agonist domain of 5-HT2A . Their results showed that although many of these compounds only produced moderate binding affinities, LSD bound with extremely high affinity, calculating a pKi value of 9.12 . Although experimentation on cell cultures may provide important information about an individual receptor or cell, it does not necessarily provide insight into the corresponding circuitry that is also involved. In order to localize these areas and understand the causal results of neural activation, actual brain structures need to be examined. One way that this is possible is by surgically excising cortical slices from rodent brains, and studying them ex vivo . This technique has been critical in developing our understanding of long-term potentiation in the hippocampus, but can also be useful in many other applications . Once removed, neural functioning in these slices remain intact and can be tested on with pharmacological interventions . For example, Aghajanian and Marek (1997) show that extracted laver V cortical neurons show increased levels of excitation when immersed in 5-HT solution . Additionally, they found that they were able to manipulate the amplitude and frequency of excitatory postsynaptic potentials (EPSPs) by modulating the activation of AMPA receptors . Despite our relatively strong understanding of the neuropharmacological effects of hallucinogens, the neural correlates attributed with these effects are mostly unknown . Part of the major reason for this lack of information is the result of strict government legislation against the use of humans in experimentation . Before being sidelined, early research showed benefits in the use of hallucinogens in the treatment of psychopathology . Testing on humans would uniquely enable us to analyze the subjective experiences attributed with hallucinogens, while at the same time imaging the brain regions involved during intoxication . Recently labs in Europe and the USA have been granted permission to test on human subjects. This requires the use of strict safe guards in order to protect participants from risk . All participants must undergo rigorous medical and psychological screening before involvement in any research. Ideal individuals are those who are experienced with hallucinogens, and have no prior history of psychotic disorders . Additionally, since the effects of these narcotics are extremely context dependent, it is important to establish a comfortable and safe environment. Areas with carpeting and couches are more appropriate than a strict clinical or hospital environment . Serotonin (5-HT) is a monoamine neurotransmitter derived from the amino acid tryptophan. In the CNS, all serotonergic neurons originate from the raphe nuclei and project diffusely to many areas in the brain . This ancient pathway is important for modulating complex behaviours like sleep-wake cycles, hunger-satiety and mood . The vast majority of hallucinogenic substances highjack this pathway, acting as 5-HT receptor agonists . In particular, the 5-HT2A subtype seems to be especially important for mediating the hallucinogenic effects of many drugs . This pathway has also become a target of clinical interest, as we commonly see disturbances in sleeping, eating, and mood regulation in various psychopathologies . 5-HT2A is a subtype of one of the seven classes of serotonin receptors . This receptor is not linked with an ion channel, but is instead associated with a trimeric G-protein complex (α, β, & γ subunits) . As illustrated in figure 2, when serotonin binds to 5-HT2A the receptor undergoes a conformation change that is translated to its cytosolic region . A bound GDP dissociates from the α subunit (known as Gq for 5-HT2A), and is replaced by GTP . This actively causes the separation of the Gq from the β/γ complex, and initiates the activation of membrane bound phospholipase C (PLC) . When activated PLC cleaves phosphatidylinositol-4,5-bisphosphate (PIP2) into inositol-1,4,5-triphosphate (IP3) and diacyglycerol (DAG) . The products of this cleavage are responsible for two distinct cellular mechanisms. DAG activates protein kinase C (PKC), which can lead to the activation of mitogen activated protein kinase (MAPK) and the activation of transcription factors like CREB . 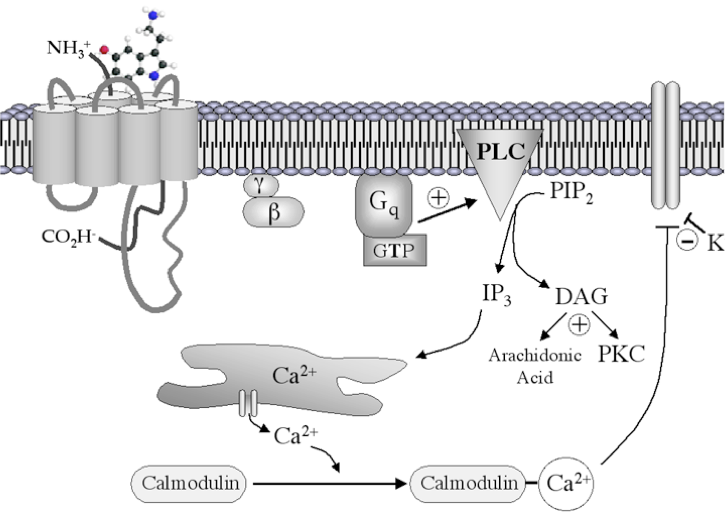 At the same time, IP3 causes the release of intracellular calcium, thereby activating calmodulin and other cytosolic proteins . These effects are known to also activate CREB, eventually leading to the transcription of growth factors like BDNF . component of the NMT mediated HTR pathway. What causes two very structurally similar ligands that act on the same receptor to produce completely different biological responses? The current hypothesis for this phenomenon is known as functional selectivity. This means that an individual receptor is capable of differentially activating distinct signaling pathways, depending on the identity of the ligand that is present at its extracellular domain . The bound molecule creates a unique and stable protein conformation, which is reflected into the intracellular domain of the receptor, modifying its interaction with cytosolic proteins . Research by Schmid and Bohn has suggested that although hallucinogens and nonhallucinogenic compounds act on the same receptor, they activate different signaling cascades . As seen in figure 3, when serotonin binds to 5-HT2A it causes the formation of a large protein complex. This includes cytosolic proteins β-arrestin2 (βarr2), phosphoinositide 3-kinase (PI3K), Src, and Akt . 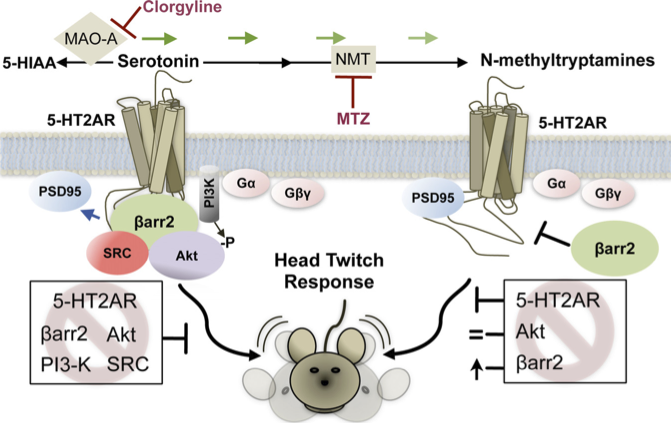 Evidence suggests that this group of proteins stimulate the serotonin induced HTR in mice, and that disruption of any one of them can diminish this effect . In βarr2 KO mice an intraperitoneal injection of 5-HT produced no HTR, except at extrememly high concentrations. However, when the βarr2 KO mice were injected with the hallucinogen N-methyltryptamine (NMT) the HTR remained intact. This seems to suggest that NMT induces this phenotype via an alternate signaling mechanism, independent of the βarr2/PI3K/Src/Akt complex . To further illustrate this distinction, researchers decided to administer methyltransferase blocker (MTZ) to stop enzymes from synthesizing NMT from administered 5-HT. What they found was that the previous HTR seen when injecting high levels of serotonin was greatly reduced . and release of dopamine from the VTA. The 5-HT2A receptor is expressed diffusely throughout the central nervous system . In the mammalian brain, we see denser populations of this receptor as we move anteriorly towards the frontal lobes ]. Projections from the raphe nuclei travel upwards, synapsing on specific neurons in the prefrontal cortex (PFC). Due to the fact that the cortex is multilayered, different physiological responses can occur depending on the level of the synapse. Figure 4 illustrates these distinct prefrontal circuits. Additionally, evidence suggests that there is reciprocal innervation between the PFC and raphe nuclei . Using a retrograde tracer known as cholera toxin subunit b (CTb), axons projecting to the raphe nuclei were followed back their cell bodies located in the PFC. These neurons were predominantly found in cortical layer V, and seemed to cluster in the medial (mPFC) . In an experiment using mice cortical slices, Beique et al. (2007) tested the effect of treatment with αm-5HT (5-HT2A agonist) on prefrontal neurons. Their results showed a systemic increase in EPSPs, which they believed to be the result of activation of a subset of deep cortical glutaminergic neurons (see figure 4). By using a 5-HT2A antagonist, known as MDL 100907, this effect was significantly decreased . Additionally, the group analyzed the validity of the popular 5-HT2A retrograde messenger hypothesis. This is the notion that activation of post-synaptic 5-HT2A receptors caused retrograde messenger proteins to induce greater glutamate release from the presynaptic neuron . By exclusively introducing a mutant silenced receptor into one individual pyramidal layer V neuron, they tested to see if this would decrease the response of its presynaptic cell. The results indicate that there was no change in the frequency or amplitude of EPSPs . For this hypothesis was valid, blocking postsynaptic 5-HT2A would need to noticeably reduce glutamatergic release at that specific neuron. Residing in the fifth cortical layer (also known as the internal pyramidal layer) approximately 50% of pyramidal neurons in the medial prefrontal cortex (mPFC) express 5-HT2A . Some of these mPFC cells project to the ventral tegmental area (VTA) and produce a modulatory effect on dopamine (DA) release in the mesocortical and mesolimbic pathways . Using rodent models, Bortolozzi et al. researched the impact of DOI administration on this circuit, and its effect on DA release. Data was collected by single unit recordings, which measured extracellular voltage changes of the VTA neurons. Additionally, microdialysis was used to measure the concentration of DA in VTA and mPFC tissue. The results showed that when DOI was directly supplied to the mPFC (via surgically implanted cannula), there was increased VTA activity . This also seemed to cause elevations of DA concentration at both the VTA and mPFC . To ensure that this effect was attributable to DOI receptor binding, an antagonist compound known as MDL 100907 was used to try to inhibit this outcome. What they found was that if MDL 100907 was administered at the beginning of the trial it significantly blocked the prior effect . decline in metabolic activity are the thalamus, cingulate gyrus, and prefrontal cortex. What are the generalized effects that hallucinogens produce on the brain? Although many studies highlight the excitatory potential these compounds have on cortical neurons, this may not be the whole story. A study by Carhart-Harris et al. (2011), used fMRI and arterial spin labeling (ASL) to measure the metabolic consumption of oxygen in the brain during psilocybin intoxication . Two groups of 15 participants were imaged under placebo and hallucinogenic conditions, and also asked to subjectively rate the intensity level of their experience. The main findings show significant decreases in many brain structures, including the thalamus and cingulate cortex (Figure 5) . These vital areas are essential to normal consciousness and sensory perception, and are heavily connected to many other areas in the cortex. Based off of the subjective assessments of the participants, decreased activation in the mPFC and anterior cingulate cortex produced the most intense effects . Additionally, an analysis of functional connectivity revealed a decrease in reciprocal activity in the posterior cingulate cortex and mPFC . From this evidence Carhart-Harris et al. suggest that the hallucinogenic properties of psychedelic drugs result from dysregulation of “connector hubs”, which causes the brain to compensate with an abnormal form of cognition . Dimethyltryptamine (DMT), a potent tryptophan based hallucinogen, is a compound known to be endogenously synthesized within the body . Despite being found in various body fluids, the exact site of synthesis and mechanism of action remain somewhat mysterious. A primary research article by Fontanilla, D. et al. addresses this topic by being the first group to implicate Sigma-1 as a possible binding site for DMT . Sigma-1, found in cells throughout the nervous system, has long been considered as an “orphan” receptor . Using a competitive binding assay, Fontanilla et al. showed that DMT bound to sigma-1 with comparatively higher affinity than unmethylated tryptamine or other known sigma receptor ligands . Additionally, they further illustrate this receptor-ligand relationship with the creation of sigma-1 KO mice. When given an intraperitoneal injection of DMT, wild type mice showed hypermobility. KO mice given the same injection showed no behavioural changes . 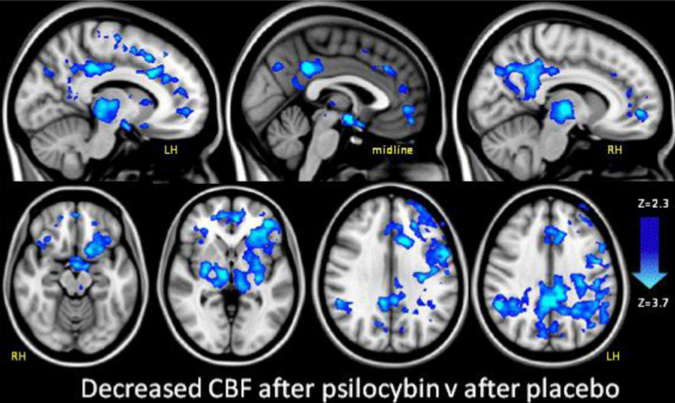 These molecular and behavioural findings are important because they provide researchers with an additional pathway of action, distinct from serotonin receptors, to further investigate the biological effects of psychedelic drugs. Can LSD be a Cure for Alcohol Addiction? Disregulations in 5-HT and associated receptors have long been implicated in the development of certain disorders . 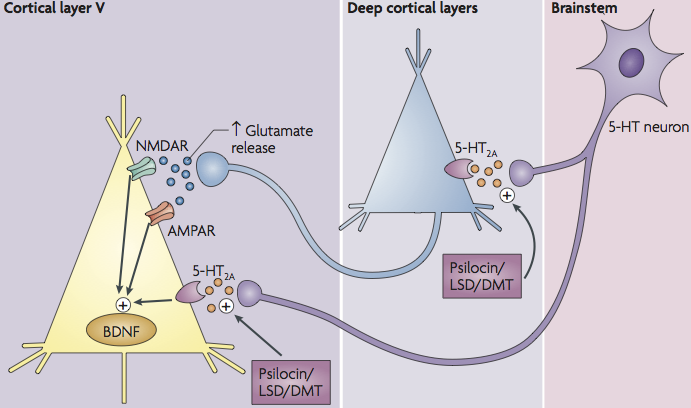 Since most hallucinogens modulate serotonergic pathways, they may provide benefits in the treatment of certain psychopathologies . Early research in the 1960s suggested that LSD and other hallucinogens aided the psychoanalytical process, and led patients to metacognitive awareness  However, due to government legislation and societal stigma, the amount of interest and subsidy and into hallucinogens greatly diminished . More recently, these compounds have once again sparked interest for their therapeutic potential in the treatment of anxiety and mood disorders . New research suggests that LSD has applications for treating OCD in treatment resistant populations . Additionally, studying their psychomimetic properties and effect on dopamine release may provide insight into mechanisms of schizophrenia . Activation of 5-HT2A has also been shown to have a plastic effect on the brain, causing increased dendritic branching in prefrontal neurons in mice . Many researchers believe that this may be the mechanism that underlies improvement from depression that occurs several weeks after treatment with SSRIs . Moreover, according to a review article by Vollenweider and Kometer (2010), an upregulation in 5-HT2A has been seen in the brains of patients with major depressive disorder, while a down regulation of 5-HT2A is seen in patients following use of antidepressants . Although this may seem counterintuitive, it actually reflects a homeostatic reaction to relative amounts of serotonin in the brain. Therefore, a drastic upregulation in 5-HT2A actually corresponds to abnormally low levels of serotonin, which is the critical phenotype seen in the monoamine hypothesis of depression. Of all the various types of psychedelic compounds, DMT stands out as the most unique. Recognized by many “psychonauts” as the most potent hallucinogen known to man, this molecule is made endogenously in the human body. But why would our bodies need to synthesize this compound? In 2001, Psychiatrist Rick Strassman postulated that DMT was the molecular basis of dreaming. In his theory the pineal gland synthesizes and releases DMT under specific circumstances, including REM sleep and in periods of high stress . Although this has yet to be proven empirically, Strassman provides compelling evidence for this claim in his book “DMT: The Spirit Molecule”. According to Strassman’s research, the pineal gland has very high concentrations of serotonin and methyltransferases, two essential building blocks for the formation of DMT . He also discusses how the placement of the pineal is ideal for dream production. Located just above the superior and inferior colliculi, the pineal can easily exert its effects on auditory and visual information before it reaches the cortex. It can also act on the nearby limbic system, or effect more distant structures by secreting neuromodulators into the cerebrospinal fluid . 4. Strassman, R. (2001). DMT: The spirit molecule. Rochester, Vermont: Park Street Press. Very interesting animated gifs Michael. Not sure if they become distracting (or hypnotic!) but I like the work you've put into this so far. Thanks for doing such a great job of getting this up. It was nice talking to you on Thursday. Best wishes, Bill. I love how you have a gallery for your wiki lol and all the animations there!! "Of specific interest are the serotonin (5-HT) receptors, which seem to be common targets for many hallucinogenic ligands"
It'll sound more solid and formal if you rephrase the sentence. for example, We are especially interested in serotonin receptors, which are the common targets for many hallucinogenic ligands. ^^ Thanks Carrie and Michael - great edits. You're up at 5 AM on a Sunday working on Neuroscience? You're welcome in any one of my classes any time! Great animations! They make the page look so lively and awesome. I linked my mention of LSD over to your page as you go much more in depth than I do and I think people would benefit from heading over here and seeing the different drug structures. I'm guessing when you say "As illustrated in figure 1323423" it's because the figures aren't up and edited yet? Or was there supposed to be a figure 1323423? Just thought I'd point it out! Haha ya, still needs to be fine tuned and cited. Thanks for ur nice comments! This is really well done, Mike. I think the organization is really effective — I like how you broke down the topic, it provides a really comprehensive overview of all the aspects of these substances. Personally I think the use of animations and images is very effective. Minor little thing that may not even be wrong (forgive if it isn't), but is the "swiss" in "swiss chemist" supposed to be capitalized? Also I presume the coding of the numbers for the bibliography is still in progress. Grammatical comments: in the sentence "Although, animal models have provided us with useful information…" there shouldn't be a comma after "although." Also, in that same paragraph, "rigerous" is spelled wrong. You can cite the pages for "REM sleep" and "stress" as part of your participation. Haha ya as a Swiss person i should have caught that one. And I have so much citing and editing to do still, so thanks for spotting those! Great topic Michael! So full of controversy I'm impressed that you even found a place where you could begin. I'm curious about the use of the word 'distortion', is that part of the definition of a hallucinogenic? I think the use of words like these (especially in scientific literature) are the source of all sorts of road blocks. Who's to say what reality looks like? I understand that as scientists we need to set for ourselves a baseline from which to operate (that being, a sober 'reality'), but we should be careful not to cast value judgements on altered states of consciousness. They use the word 'alter' in the DMT preview, I liked that. It connotes no privileged viewpoint. I know it's a subtlety, but it reflects an outlook I often find within the scientific community, especially in the neurosciences, and especially-especially in cognitive sciences. What do you think? Also, I'm curious about the rodent models. If the only effect which can be distinguish the effects of a hallucinogen from other substances is a head twitch, can we be sure that they're administering the proper dosage? Also, what sort of environment are the mice in? Is it the equivalent of the hospital room or the lounge (as mentioned in the bit on LSD)? My concern here is that i) the mice are having way too much, and thus the physiological responses seen are likely to be extreme and perhaps a 'distortion' (lol) of the actual physiological response under milder circumstances, and that ii) the mice are being stressed out, mostly due to their environment (lab set ups never seem to be the friendliest places), and perhaps slightly due to the alien nature of it all (they're a mouse.. and it's DMT). A stressed response, again, would lead to a different physiological response. I enjoyed the read! Happy studying! !